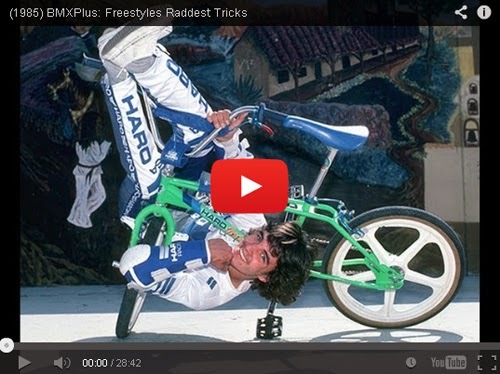 BMX Plus - Freestyle Raddest Tricks made in 1985 by Trends in Professional Sound And Video Dimensions... Features riders Ron Wilkerson, Mike Buff, Rich Sigur, Scott Freeman, Scott McCloud, Robert Peterson, David Nourie, Martin Aparijo, Brian Scura, John "Dizz" Hicks & Brian Blyther... Footage at Pipeline as well as How-To instruction. BMX Plus - Freestyle Raddest Tricks hecha en 1985 por Trends en Professional Sound And Video Dimensions... Ciclistas Protagonistas: Ron Wilkerson, Mike Buff, Rich Sigur, Scott Freeman, Scott McCloud, Robert Peterson, David Nourie, Martin Aparijo, Brian Scura, John "Dizz" Hicks & Brian Blyther... Incluye trucos en media tubería y procedimientos de como hacerlos.